Creative and applicable academic achievement/improvement comments and phrases to use while completing the report card process. These comments can also be used during parent-teacher conferences. If ______ will continue to put forth the effort he has shown in the past two reporting periods, he will receive a great deal from his schooling. The following suggestions might improve his ______. ______ is making progress in all academic areas. She is having some difficulty with ______, but if she continues to work hard she will see improvement soon. ______ takes great pride in all of the work he does and always does a neat job. ______ volunteers frequently and makes wonderful contributions to class. She does tend to work too quickly, which results in many careless errors. We can help her to correct this at home and at school. ______ is a very hard worker and has excellent vocabulary skills for his age. He enjoys reading and writing. ______'s excellent attitude is reflected in the work she does. Thank you for your efforts. Although ______ tries to do his best, he often has difficulty keeping up with the rest of the class. Can we meet to discuss this? I am concerned about ______'s progress this year. She has shown some improvement but her growth is not where it should be at this point in the school year. Please call to schedule a conference so we can discuss this. As we discussed in our recent conference, _______'s work is below grade standards. I am sure with that more effort and concentration he will show rapid improvement. ______ has great enthusiasm for everything we do in class. However, she is having some difficulty with _______. Please continue to review this with her nightly. ______ is strong in _____. 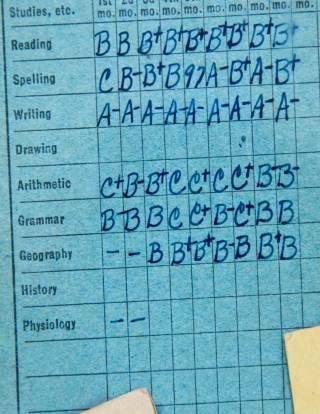 ______ has earned a very fine report card. ______ has a vast background knowledge of _______. ______ is a very fine and serious student and excels in ______. ______ is working well in all basic subjects. ______ is working above grade level in ______. ______ is especially good at ______. ______'s low rate of achievement makes it difficult for her to keep up with the class. ______ is capable of achieving a higher average in the areas of ____. ______ has had difficulty with learning ______, so in the coming term we will focus on ______. ______ is capable of much better work. ______ still needs guidance and support from both you and me. ______ has been most cooperative and only needs strengthening in social studies skills to bring her up to ____ grade level. ______ has been receiving low quiz/test scores. ______ does not work up to her ability. ______ has difficulty understanding the material. This subject is being modified to better match ______'s ability. ______ is continuing to grow in independence. ______ has been consistently progressing. ______ has shown a good attitude about trying to improve in ______. ______ seems eager to improve. ______ has shown strong growth in _______. ______ is making steady progress academically. ______'s quality of work is improving. ______ has strengthened her skills in ______. ______ has shown an encouraging desire to better herself in _______. ______ would improve if he developed a greater interest in _______. ______ has made nice progress this reporting period. ______ is maturing nicely, and I hope this continues. ______'s classroom attitude shows improvement.